Subi’s Clancy Wheeler was again important. Photos by Les Everett. Click to enlarge. 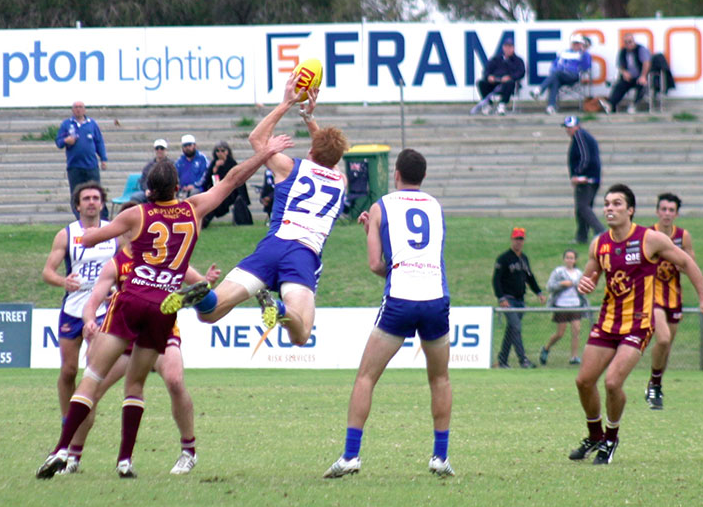 A windy rainy day at East Fremantle Oval usually does not bode well for visiting teams. However on Sunday Subiaco played with great intensity and after Clancy Wheeler kicked the first two goals the Lions never looked back. Subi completely unsettled the usually steady Sharks defence – generally through weight of numbers with midfielders doing the damage. Adam Cockie kicked three goals and led a strong midfield with Kyal Horsley and Chris Phelan. Hamish Shepheard kicked three goals, Greg Broughton played his best game of the year but didn’t get value for the times he sneaked forward while Aaron Heal and Declan Jackson were again very enterprising in defence. Ruckman Sean Bradley performed well in the ruck. Brock O’Brien was lively for East Fremantle and kicked two goals, Lewis Krakouer kicked three goals on debut, Jayden Schofield provided some good run and James Bristow battled hard as usual. A desperate (unsuccessful) attempt to mark from James Bristow. Click to enlarge. In the other Sunday game South Fremantle scored eight goals to three in the second half against Peel in a game where both teams suffered multiple injuries. Brock Higgins was wonderful in the ruck for the Bulldogs in conditions that suited his bullocking style, Zac Strom kicked three goals and handled the wet well, Ben Saunders also kicked three goals while Tim Kelly and Shane Hockey worked hard in the midfield. Ed Langdon put in a spectacular performance for Peel and kicked five goals, Blair Bell was again impressive, Brayden Lawler used the ball well in the midfield, Tendai Mzungu and Garrick Ibbotson also performed strongly. Claremont kicked seven goals in the last quarter at the Showgrounds but couldn’t quite catch West Perth and saw their finals hopes fade away. Jay Van Berlo led the way for the Falcons along with Shane Nelson and Aaron Black, the WAFL’s best tagger Dean Munns did the job on Jye Bolton and Andrew Strijk kicked theee goals. Jared Hardisty made the most a late recall to be Claremont’s best player, Jack Richardson and Ben Maister kicked three goals and Tom Ledger also played well. 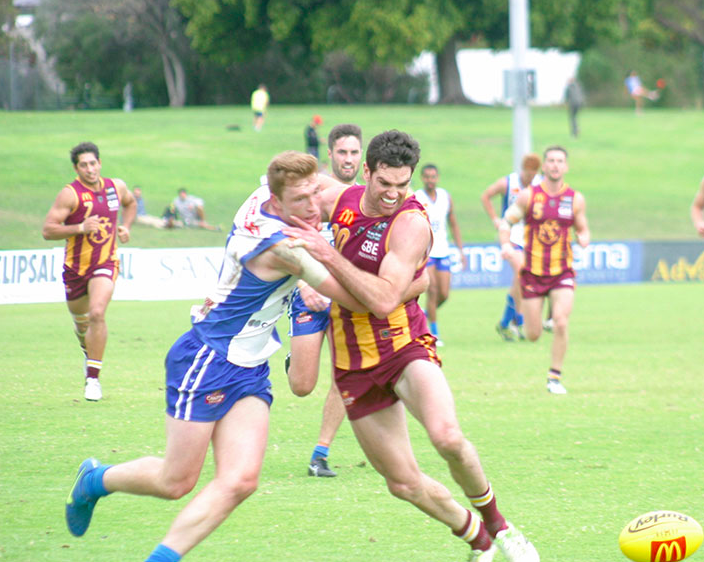 East Perth’s seven-goal last quarter took them to a comfortable victory over Perth. Scott Lycett earned a celebratory drink with a best-on-ground effort in the ruck for the Royals. Patrick McGinnity and Jack Nelson also played strongly. Clint Jones and young defender Lennon Marlin were good for the Demons. The win put East Perth within striking distance of the top five.